Your initial appointment begins with a phone call to Back On Track Wellness where you’ll chat with one of our friendly staff members to collect personal information and set up your appointment. For your convenience, we’ve included our paperwork for you to download and complete at home if you choose. Please don’t hesitate to contact our office at (207) 899-0806 with any questions at any point! Next comes your first appointment at Back On Track, which takes about an hour, start to finish. You’ll be greeted, and if you haven’t already done so, be asked to complete paperwork in our waiting room while we make a photocopy of your insurance card. Please take a moment to relax and to refresh yourself. Then, we’ll give you a brief tour of Back On Track. 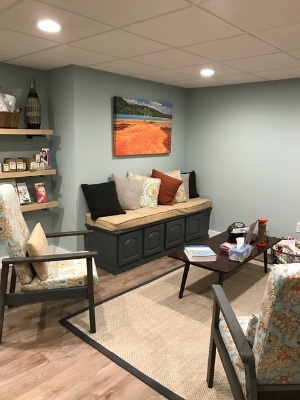 Dr. Sara will then take you into the private adjusting room to discuss your health history, as well as explain a little more about her personal chiropractic style and how it will help. She’ll also perform orthopedic and neurological exams for more information on your current condition. After these assessments, Dr. Sara will adjust your spine and determine a treatment plan for you. At any point, please ask questions and she’ll be happy to answer them. Depending on your current situation, Dr. Sara may use other treatments such as ultrasound, traction, or trigger point therapy to help aid in your recovery. After these treatments, you’ll then schedule your next appointment and take care of your payment. Many patients are seen on a weekly basis for a short time until their health progresses, and then space out subsequent appointments to what works best for their bodies — which could be every 2 weeks, 3 weeks, or monthly, etc. Subsequent visits take about 15-30 minutes, and will include an adjustment and possible therapies. Dr. Sara may also recommend massage therapy, strengthening exercises, stretching, or other self-care strategies to help you get your health back on track. We’re here to help you, so please do not hesitate to ask any questions before, during, or after your appointment. Call our South Portland office today with any questions and to schedule your appointment!